September has been a bumper month, chock-full of (mostly) good things. In fact, it’s been such a busy month that I only realised about an hour ago that I haven’t written a blog entry and tomorrow is the first of October. I don’t know if I was lucky this year or if Dublin Fringe Festival was especially good but every show I saw was on the high end of the rating scale. I went to several shows and reviewed four of them for The Reviews Hub. They are, in no particular order, Animalia, The Humours of Bandon, The Wickedness of Oz, and Coast. Overall feedback I’ve heard from fellow reviews and friends suggests that it was a very good festival indeed. Culture Night was in the middle of September (and of Fringe). This year I was invited to read at an event run by Poetry Ireland in the Chapel Royal in Dublin Castle. Public speaking is not my forte but I was delighted to be invited, which was on the back of placing in the Poetry Ireland/Trócaire Competition earlier this year. I read two poems, Moments of Snow and Once Blue. Admittedly I was nervous in the lead up to the event but like most things it was absolutely fine when the time came. There was a wide selection of poets, ranging from school goers to the more senior of us, and the talent was impressive. I was chatting with the lovely Angela T. Carr while there and was blown away by her poem The Truth About Figs, which will be published in the October/November Issue of The London Magazine. All in all it was a lovely evening and Dublin city was buzzing the whole night through. Not that I got to see too much of it- after an impromptu celebratory dinner and a few G&Ts I was home and in bed at a very reasonable hour. I have to be honest and say that this month I’ve neglected my editing and redrafting duties regarding Bitten By A Dog On Tuesday. Everything is nearly there but just not quite. That said, I’ve a feeling it’ll never be exactly right but I know it’s not right enough just yet. I’m chomping at the bit to start two new projects, my next novel and a stage play. I know I’ve had to put several things on the back burner this year as other projects naturally got in their way but that’s just the nature of things sometimes. I’m hoping to get the first draft of my next novel done by Christmas but I’m also piecing together a play that’s been in my mind for ages and I think it’s time to take action. The untitled play follows the last few weeks in the lives of the Romanov sisters: Ogla, Tatiana, Maria, and Anastasia. I want to begin working on it now as the centenary of their deaths is in 2018 and I’ve always been fascinated by them. I’ve been researching them causally for years but now I need to be a bit more precise about it and figure out how I want to tell their story, or rather, how they want me to tell if for them. The Creative Writing Course I’m facilitating started in mid-September and so far it’s going very well, if I do say so myself. It’s a small group but this gives it a workshop atmosphere, which I think enhances the experience. Each week I’ve been impressed and delighted by the participants’ willingness to engage and share their work. We’ve got three more weeks left and it’s flying by. I hope everyone else is enjoying it as much as I am. I did manage to get a tiny weekend trip to Dunmore East in also, which was needed but I found it hard to unwind to be honest. Only on the second day did I feel I began to relax and the on the third day it was time to go home. None the less, it was enjoyable and I got to visit Mount Congreve Gardens as well as have some lovely meals at The Strand Inn. 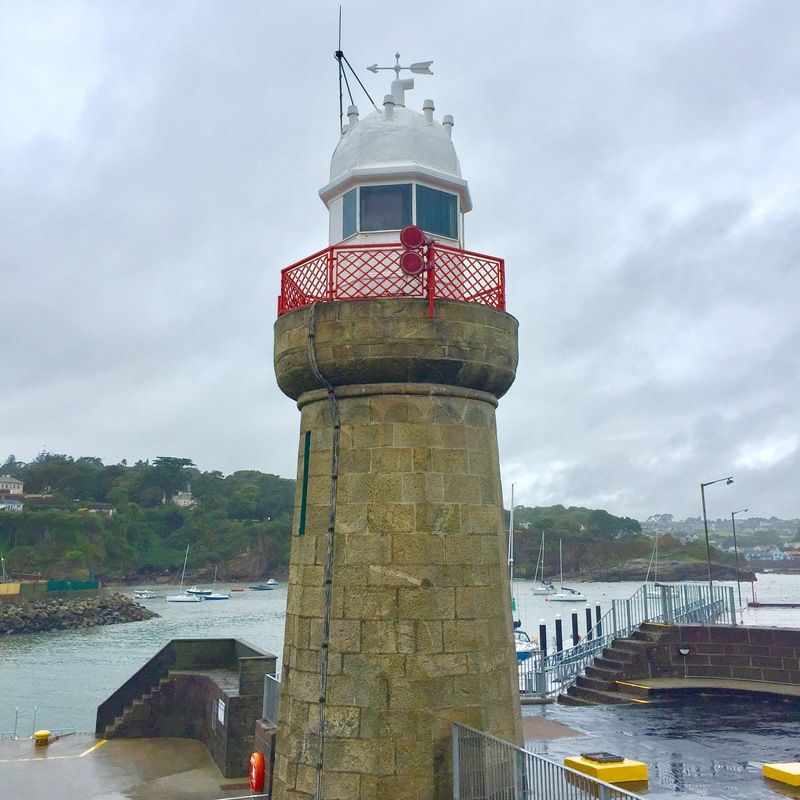 Harbour Tower at Dunmore East, Co. Waterford. Dublin Theatre Festival began yesterday and I’ve already been out and about for it. There are some amazing looking shows taking places throughout the city and county and I’m lucky to be going to several of them. I’m particularly looking forward to seeing Olwen Fouéré in Death at Intervals, running at Smock Alley from 4 – 8 October. So it looks like October promises to be as culturally enlightening as September and I’m going to get back on track with my research and writing.